Availability : Currently under evaluation. We have an exciting Bengal kitten litter announcement! Argyria and SWAK are the proud parents of 5 adorable Bengal kittens born on July 5! In this litter, Agryria had 2 silver kittens and 3 brown kittens. Check back for updates and new pictures! 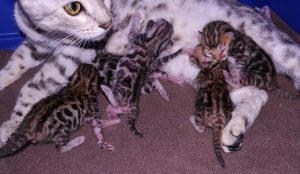 This entry was posted in Bengal Kitten Gallery and tagged bengal kittens, Bengal kittens for sale. Bookmark the permalink.